This is one of those images I had to wait four years to process to finally achieve the look I intended from the beginning. I took this photo during a mid-August visit to New York. It was one of the hottest days of the year, with the temperature way above 30°C and with 100% humidity. It was probably the worst weather for any photography; the air was hot and hazy, and everything looked dull and grey without any shadows or highlights. I was taking photos without much hope of producing anything interesting. Back at home, I tried to process my raw images using Lightroom, Photoshop, and Nik tools, but I did not manage to get anything decent out of them. I gave up and considered my 2010 New York trip a photo disaster. Four years later, the advances in HDR Photography processing changed everything . I took 3 original bracketed photos I had taken from the Brooklyn Bridge back in 2010, processed them in Photoshop HDR Pro, and then edited the 32bit merged TIFF files in Lightroom (see my free guide “Natural Looking HDR Workflow”). – Topaz DeNoise helped to eliminate noise (sky, clouds ). I noticed that the place you took this picture is on the Brooklyn Bridge. Can you just walk on the bridge? Or if you drove on the bridge, how could you stop and then took this pic? Thank you! I have driven several times through Brooklyn bridge but I have never noticed there is a pedestrian way. 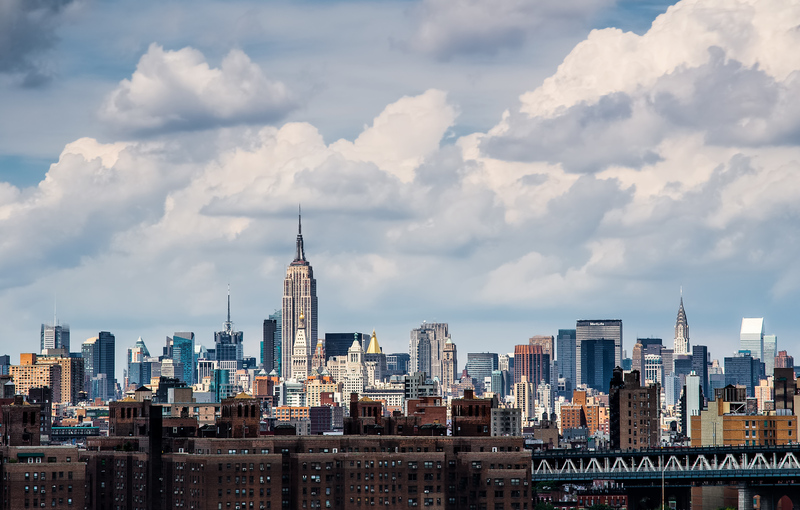 I live near to NYC so I really want to shot the skyline. But every time I was so busy :(. Also I have read your previous post about the best viewpoint for Manhattan is located in New Jersey. And I also want to be there! I am glad I could help. I am working on another Photo Location Guide post dedicated to New York, should be published in the next couple of weeks.